Greece can boast for the fact that it produces some of the highest quality, tastiest and healthiest foods in the world. With a strong sense of commitment, hundreds of secondary-sector producers throughout the country standardize top-quality olive oil, cheese products, honey, wine, peppers and much more. Nowadays, what food traders and importers most need is help from companies which have experience and are consistently active in the tertiary sector, offering high quality export services. 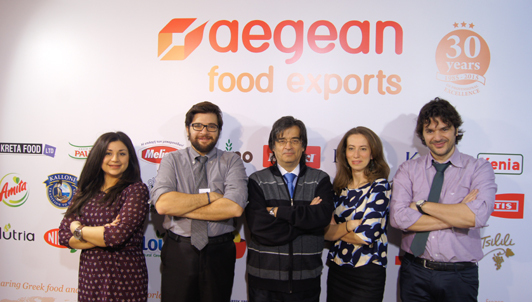 Aegean Food Exports has assumed this role since 1985. A pioneering Greek family business, exclusively export-oriented, it has been promoting Greek foods and beverages in 16 countries for over 25 years. Aegean Food Exports exports its goods to large markets in central Europe (Germany, Austria, Switzerland, United Kingdom, Sweden and others). Has an annual turnover (sales) over €10,000,000. Has no warehouses, which saves products costs. Orders are shipped straight from the producer. Offers the lowest prices, as producers have a special pricelist for Aegean Intertrade, for its entire turnover recorded in 16 countries. Employs five people all specialized in food exports. Offers branding, labeling and new product design services (packaging). These services are provided on a case-by-case basis. Works with market leaders, i.e. leading food producers with export potential that can back large contracts, are innovative, competitive, etc. Offers quite an extensive range of products (more than 5,500 codes) in its one-stop-shop. Is innovative, following global market trends. Aegean Food Exports was the first company to export organic Greek olive oil to the United Kingdom in 1992, certified by a British certification body.